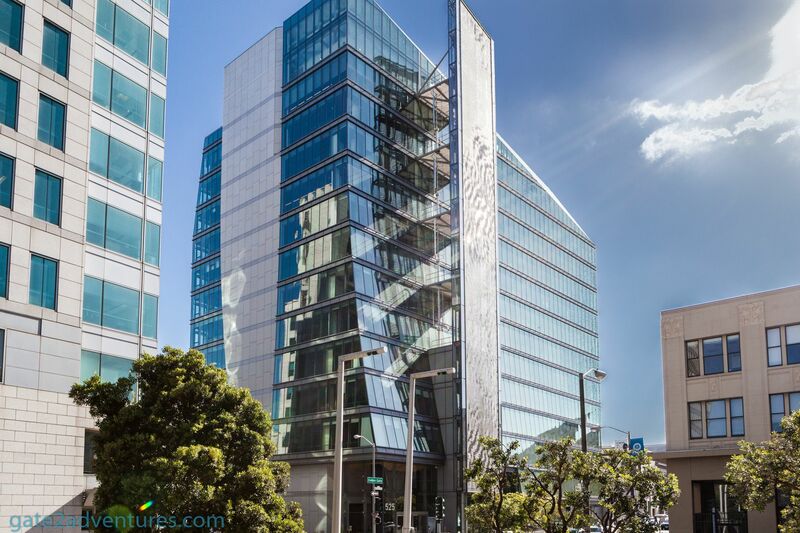 In mid-2015 the San Francisco Mayor Edwin M. Lee unveiled the new San Francisco Public Utilities Commission HQ in the Civic Center Plaza. 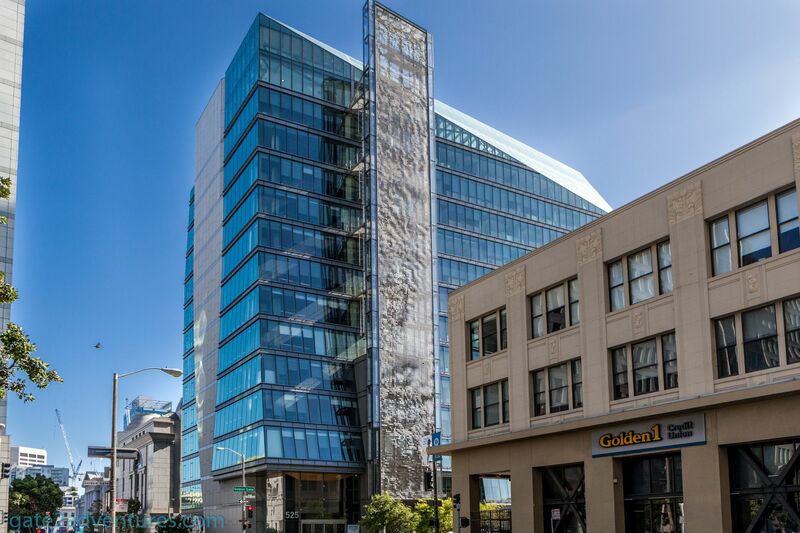 The 13-story building is one of the few LEED Platinum certified buildings in the world and as well one of the greenest buildings in North America. The building cost 146.5 million USD to construct and was built “ahead of time”. Clear forward thinking and planning for the future was the main goal during development and construction. The building comes with some remarkable engineering. It has a wind turbine which generates electricity from the wind. Of course, there are solar panels as well to harvest the energy of the sun. Besides generating energy, the building is designed to save energy and water as well. A very unique and special part of this concept is served by the “Living Machine”. It reclaims and treats wastewater which will be used to 100% for the building’s toilets and urinals. Rainwater can be collected and will be used for the outside irrigation of the building. The lobby of the building is open to the public from Monday to Friday during business hours (8 a.m. – 5 p.m.). In the lobby, you get a glimpse of the “Living Machine”, Rain Portal Art Installation and the Digital Arts Wall. On the Digital Arts Wall, you get to see the path of the water from the High Sierras all the way to San Francisco. Start your exploration at the far right side and walk along the wall. As you progress you will see information pop up about the 10 stations along your journey. The Digital Arts Wall is located next to the cafeteria. Sit down grab a coffee and explore this beautiful art installation. Besides the public accessible lobby, you can sign up for a free tour of the building and actually get to go inside and up to the top. You will hear all the cool facts about the building and the art installation. This tour takes about an hour and you need to register online on Eventbrite. Tours are every second Wednesday of the month from 2:00 p.m. to 3:00 p.m. I know these times are not the most convenient for most. This guided tour is very informative and worth to go on. Especially as an SF-resident, you should take the tour. I love such behind the scenes looks and this gives you a different perspective what’s going on here. There will be no more spoilers about the building and what you will learn on the tour. Just sign up for the tour yourself and enjoy it. It’s free and fun. If I tell you all the details now, you probably get bored during the tour. We don’t want that to happen. 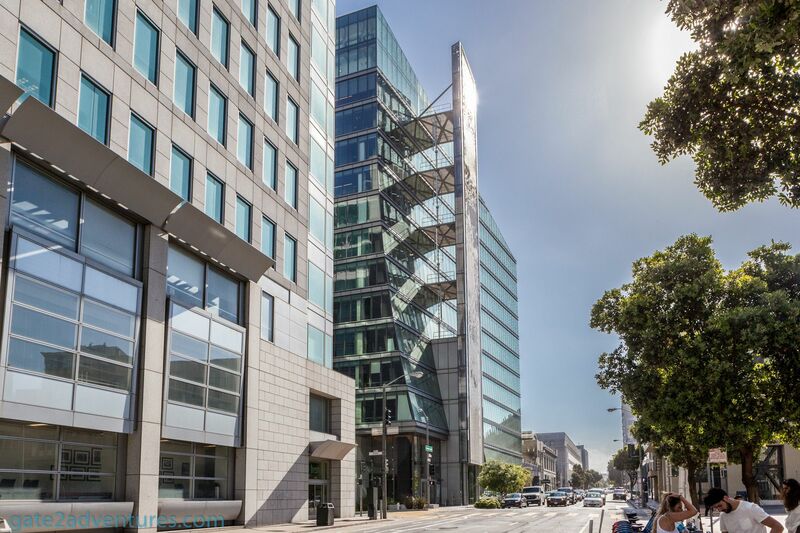 By the way, it’s not only worth to see the inside of the building you also get some great opportunities to take pictures from the area around the SFPUC HQ. The tour lasts about an hour and is absolutely worth your time. View from the SFPUC on a rainy day. It’s great to see what’s possible to save energy and water for future generations. If you are interested in architecture, this tour is a must for you as well. Did you ever wonder what the so-called “Firefly Wall” art installation is before you took the tour and it got explained to you? This art installation with 14,000 tiles is illuminated at night and simulates the movement of fireflies when the wind is moving the tiles. During the day it looks like waves on a piece of water. Pretty cool installation. With the wind turbines located behind this art installation, they look less intrusive and are somewhat hidden. Wait, there is more to see. Besides the tour of the SFPUC headquarter, check also out the Pulgas Water Temple, Sunol Water Temple (currently closed for renovation) and take a tour of a wastewater treatment plant. All of these tours are for free as well. Have you been on the tour yet and if so, did you like it?